LOST'S EVANGELINE LILY. EVANGELINE LILY THE DARK ANGEL OF LOST. ROLLING STONE MAGAZINE. JACK WHITES NEW BAND. FIONA APPLE BACK FROM THE VOID. OCTOBER 2005. JOAQUIN PHOENIX WALKS THE LINE. FRANZ FERDINAND FUNK IT UP. "LOST REVELATIONS". BOX LOADER SET OF 3. BL-1 BL-2 BL-3. Surprise that Lost lover for Christmas! From my smoke free home. LOST - SEASON THREE. ALL IN POCKET PAGES & READY TO BE ADDED TO YOUR ALBUM. 90 COMPLETE BASE CARD SET. LOST - SEASON ONE. 90 BASE CARD SET. Dharma Lapel Pin. The Dharma Institution set up a lot of things that revolve around the world. 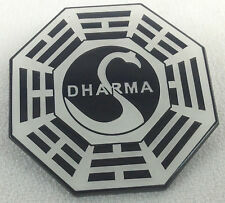 This pin features the main logo the Dharma institution. (Mix & Match from our large selection). KATE & JACK. INSERT BOX LOADER. LOST - SEASON ONE. IF AT ALL POSSIBLE. SET OF 9 FOIL TIES TO THE ISLAND. 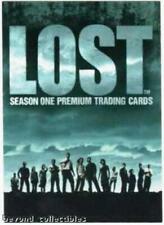 MISSING: OCEANIC 815 FOIL PUZZLE CARDS. LOST - SEASON ONE. IF AT ALL POSSIBLE. M1- M2 - M3 - M8 - M9. BOX LOADER. "LOST SEASON 2". BL-1 BL-2 BL-3. COMPLETE FOIL SET OF 6. "LOST SEASON 2". B-1 THRU B-6. Lost ID Badge. New never used. It is available on either a blue or black hat. If you do not choose we will send our choice. COVER STORY. CLOSE ASSOCIATE DOMINIC MONAGHAN REVEALS HIS THEORY. COVER - LOST SURVIVOR CHARLIE - DOMINIC MONAGHAN (FLASHBACK). TV ZONE # 195. THE DEAD ZONE - COMPLETE COMPREHENSIVE GUIDE TO SEASON TWO. 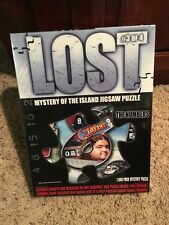 Mystery of the Island Jigsaw Puzzle. A small group of passengers miraculously survive the crash of Oceanic Flight 815 only to find themselves off course and stranded on a tropical island. But this island is not the paradise it appears to be. Hand signed autograph. Nice 8 x 10 photo from the Lost TV show. Lost Autograph. SET OF 9 FOIL PUZZLE CARDS. FIGHTING BACK. SET OF 3 FOIL LOOKING GLASS CARDS. LOST - SEASON TWO. 90 COMPLETE BASE CARD SET. LOST - SEASON THREE. 90 COMPLETE BASE CARD SET. LOST - REVELATIONS. 81 COMPLETE BASE CARD SET. Pirates of the Caribbean Art Print of Jack Sparrow 5"x7"
It is in very nice condition and is in a plastic bag. The size of the matte is 5x7" and the print is 3x4". This is from my own collection. 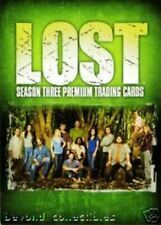 LOST "Sayid Jarrah" Art Print 8x10"
The art print is of SAYID FARRAH. The size of the matte is 8x10' and the actual print is 5x7.5". It is in very nice condition. This is a SET of 3 Lost buttons to wear if you are a Lost fan or going to a convention. They feature I "lost" these buttons on my bookshelf for several months and just found them. This 1000 piece jigsaw puzzle is new in a sealed box. Made in the USA. Puzzle #1 of 4 puzzles. Never opened. 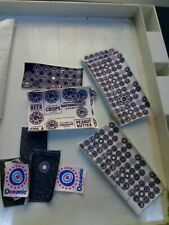 2 LOST promo scratch-off tickets - QUITE RARE! No reserve! Two LOST promo scratch-off tickets. Condition is New. One ticket has a number partially worn away. These were given away in stores in major cities as a promotional item when the show first premiered. I've never seen these anywhere ever since. (I'm pretty proud of myself for working almost all the numbers into the auction) Shipped with USPS First Class Package.